Conrad J. Storad is the award-winning author or editor of more than 50 science and nature books for children and young adults. He also writes a science/nature column called “Conrad’s Classroom” in Story Monsters Ink, a national-award winning magazine launched in 2014. In July 2018, the Book Publicists of Southern California presented Storad with the IRWIN Award for Storyteller of the Year. In March 2017, Storad achieved a career goal during an author visit in Tempe, Arizona. He has now read stories to more than 1 million students and teachers. Storad has conducted writing workshops and presentations at more than 1,500 schools, libraries, and author events in 17 states to promote reading and science literacy. Storad worked at Arizona State University for more than 24 years writing and editing stories about science and scholarship. 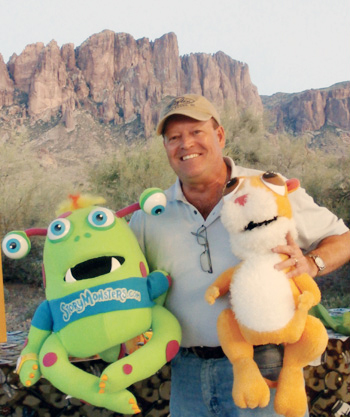 He was founding editor of the nationally award winning ASU Research Magazine, and for Chain Reaction, an award-winning science magazine for young readers. Prior to ASU, Storad worked as a reporter, editor, and general manager for The Barberton Herald newspaper in northeast Ohio. He was a science/medical writer for the U.S. National Cancer Institute and a science/feature writer at Kent State University. Storad earned a degree in mass media communication from the University of Akron in 1979, and was one of the first class of students to earn a master's degree in mass communication/science journalism from Arizona State University in 1983. He was a Year 2000 inductee to the ASU Walter Cronkite School of Journalism Hall of Fame. Storad is a member of the National Association of Science Writers, Society of Children's Book Writers & Illustrators, Libraries Limited, and is past president and emeritus member of the University Research Magazine Association. Storad is a 2017 inductee to the Walk of Fame in his hometown of Barberton, Ohio. Human beings are story loving creatures. However, from the early days of painting on the walls of caves, humans have never been alone in their love for stories. Something else has always been watching and listening. These watchers are shy. These listeners do not want to be seen. They have many names. They come in many shapes and sizes. These watchers are Story Monsters®. Do Story Monsters spring directly from the human imagination itself? Or do they come from somewhere else? No one is certain. Story Monsters are shapeshifters. They can assume the size and form of many things. They might be the size of a pea or as large as an oak tree. In ancient days, Story Monsters often took the shape of elves, dwarfs, trolls, or giants with a single eye. In some places they appeared as flame-spewing dragons, a three-headed dog, or as a monstrous woman with hair made of venomous snakes. In other lands they appeared as leprechauns, hump-backed flute players, ugly witches, snarling wolves, or as beautiful princesses with long flowing hair. Story Monsters are still here today, in modern times. They still appear in many shapes and sizes and forms. Today, they might look like big red dogs or curious little monkeys. They can appear as a wooden puppet with a long nose or maybe a cat with a tall striped hat. Others have reported Story Monsters as a long Mama rattlesnake or as a very flat little boy. One thing is certain, Story Monsters love stories. If someone is reading a book or telling a story, you can be sure that at least one Story Monster is somewhere near. I found the one pictured with me many years ago. It was hanging out near boxes of books in my garage in Tempe, Arizona. It always shows up when I visit a school or library. It likes my books and loves to listen to my stories. Story Monsters are always among us. They can be anywhere and everywhere. Keep your eyes and ears open, and never stop reading! Story Monsters is a registered trademark of Story Monsters LLC.